I’ve tested the tool on several 32 and 64-bit platforms but I would love to get some feedback/feature requests. To execute the script, ensure that your execution policy allows you to execute scripts. If not, no worries. 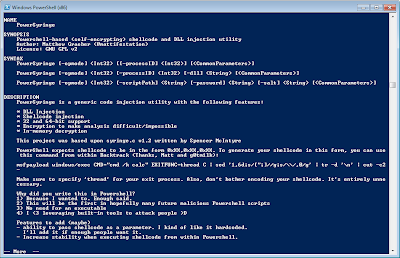 You can simply copy and paste the all of the code into a PowerShell prompt. Then you can run ‘help PowerSyringe -full’ for detailed documentation. There are several other methods for bypassing the execution policy. One of those methods is detailed here. Inject 'evil.dll' into process ID 4274. 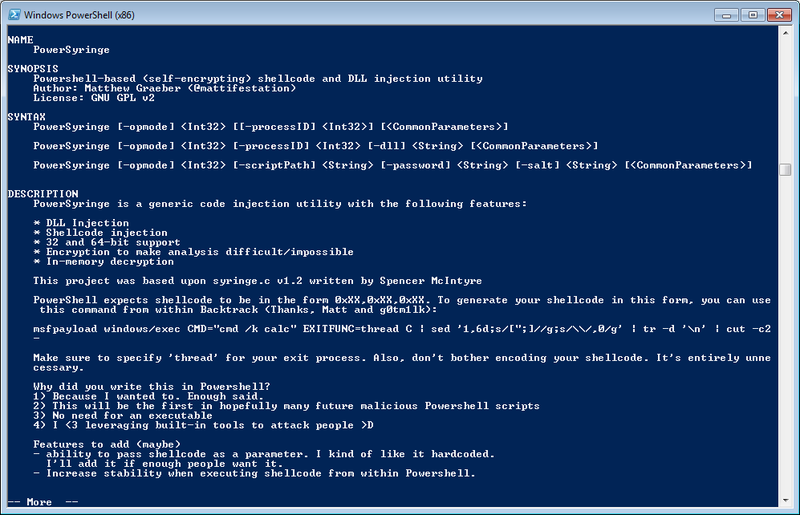 Execute the shellcode as defined in the script within the context of Powershell. Encrypt the contents of this file with a password and salt. This will make analysis of the script impossible without the correct password and salt combination. This command will generate evil.ps1 that can dropped onto the victim machine. It only consists of a decryption function 'de' and the base64-encoded ciphertext. (i.e. define the function) PowerSyringe entirely in memory assuming you provided the proper password and salt combination. Upon successful completion of these commands, you can execute PowerSyringe as normal. As you can see, the decryption script is slightly 'obfuscated' if you even want to call it that. It's pretty obvious that it decrypts the $a variable. Unfortunately, anyone performing analysis on this evil script will have no idea what the contents of $a are without the correct password and salt. The primary reason I wrote this was because I had been using Syringe on assessments to bypass host-based IPS systems but I didn't like some of the limitations of Syringe (specifically, no 64-bit support) and I like the idea of performing everything in memory without needing to drop any executables. That being said, I welcome your constructive feedback.